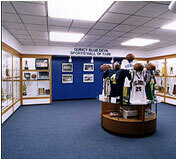 The purpose of the Blue Devil Hall of Fame of Quincy Senior High School is to honor and recognize men and women athletes and coaches who have been outstanding in athletics. The award could also be given to others who have given meritorious service to the athletic program of Quincy Senior High School. 1. Current Principal of Quincy Senior High School or their appointed representative. 2. Current Athletic Director of Quincy Senior High School or their appointed representative. 3. A member representing the Hall of Fame Board of Directors. 4 & 5. Appointed from Quincy Senior High School Sports Booster Clubs by the current athletic director. 9, 10 & 11. At-Large community representatives who are appointed by majority selection from the set committee members. B. All committee member's (11) have full voting privileges concerning committee action. C. The committee shall elect within itself the following officers on an annual basis: Chairman, Vice-Chairman and Secretary (optional). A simple majority of those in attendance is necessary to elect an officer. D. Terms of membership to the committee shall be five (5) years. The original selection process will fill vacancies or unexpired terms. The exception to this rule is that the Chairman's position can be renewed annually. E. Committee members and officers can be re-appointed or re-elected after a three (3) year absence. F. The official year for the committee will be April 30th to April 30th. G. For the Hall of Fame Committee to conduct official business, a quorum of nine (9) members is necessary. To change the by-laws, seven (7) of the eleven (11) votes would be needed. When the committee is conducting official business and a majority of the committee feels a stalemate has occurred in the secret balloting process, the committee, if it feels it is in the Hall of Fame's best interest may present a nominee on the ballot for election to the Hall of Fame. The motion must have a second and at least 75% of the quorum present must vote for the nominee for induction. 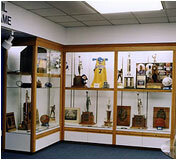 H. The purpose of the committee is to find nominees for the Hall of Fame and select inductees into the Hall of Fame. This committee shall also review the constitution and bylaws on an annual basis to see if additions or corrections should be made. Those who participated in Quincy Senior High School athletics having earned a letter in a particular sport or sports for at least two years. In addition, received "All-Conference-District- Sectional or State Honors. The athlete must have graduated from Quincy Senior High School and been out of school for more than then (10) years. A Quincy Senior High School graduate who participated in Quincy Senior High School athletics and competed in college athletics or has attained a profession in athletics. This person must have been out of school for a minimum of ten (10) years. Coaches at Quincy High School, past or present. Those who have been given meritorious service or a loyal friend to the athletic program. A Quincy Senior High School team, which has attained record status or state recognition and been out of school ten (10 years. Any individual or team that wins a State Championship and graduated from Quincy Senior High School is automatically nominated after a minimum of ten (10) years. Names for nomination can be submitted to the committee at anytime by anyone or by the committee members themselves. The selection committee shall submit the potential nominee to the chairman no later than 7 days prior to the announced meeting. A person, to be designated by the selection committee will then present each nominee to the selection committee for voting. This person will not vote. 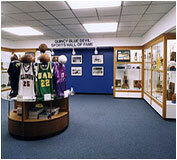 To become a member of the Hall of Fame, the person must be nominated and seconded by someone on the committee. If a person is on the ballot and has not received more than 2 votes during a two-year period, they will be removed from the list. That person may be re-nominated in the future. To be enrolled, the nominee must receive a minimum of 75% of the votes of those present. This vote is secret. No more than three ballots will be presented at any one meeting. In the event that a committee member is being considered as a candidate for the Hall of Fame, they are not to vote when their name comes up and they must receive a minimum of 75% of those voting. No more than three candidates in each category of eligibility can be enrolled in any one year (unless on a team). However, no more than nine in any year can be inducted into the Hall of Fame. It is not necessary that the award be given each year. There can be no more than -9- votes by each member for the first ballot, no more than -7- on the second ballot and no more than -5- on the third ballot. An individual or team is inducted on the date they receive the proper amount of votes. The Quincy Senior High School Hall of Fame Board of Directors in conjunction with the selection committee will present the inductee with an appropriate award. The inductee will also be recognized, if possible at an even in which the person participated as well as the Quincy Senior High School Thanksgiving Basketball Tournament for the Formal Induction. The Quincy Senior High School Hall of Fame Board of Directors will select the awards presented and will bear the expense of recognition for inductees as well as selection committee expenses.